Only 12% of the U.S. population is health literate. Health and safety information should be delivered on a fifth-grade level. “Why” is a crucial question to ask and to answer in resident wellness. Did you think about how you and your clients communicate and how instruction is delivered? Do you talk to your clients, or do your discuss with your clients? Let me ask you this: How often are you creative with your answers? How often do you use analogies that can be seen in the everyday world? I love using analogies. The body is an amazing machine, but also a mystery to many. I know we have all explained osteoarthritis many times over in our careers, but how well is the message getting through to the client? We can try to explain that the cartilage in the knee has slowly been worn down over time due to previous damages that may have occurred. Now imagine that you have no idea what cartilage is, or can’t picture it. Would anything after that word mean anything to you? Probably not. So let’s put some visualization to this. Cartilage covers bones where they will meet with other bones and rub together. It is like a wet plastic sheet. Over time, damage happens because of impact from the many falls, running, and jumping that we have done. It also becomes more dry and brittle as we get older. Because of the damage and the dryness, the bones do not slide across each other smoothly anymore. The rough surfaces rubbing together will cause more damage, and the moist plastic lining is not there anymore to stop the bones from rubbing together. This explanation took a little longer, but I also know that the client now has a good picture in their mind of what is happening inside their knee. One surprising statistic I learned while in my physics class in college is that if you hold a gallon of water straight out in front of you, your shoulder has about 100 pounds of pressure on it, even though a gallon of water is approximately 8 pounds. This is a statistic I am always passing on to my senior wellness clients. It can be very hard to understand why such a small weight is so difficult to lift, and maybe even painful. Some even feel embarrassed that they can’t lift a larger amount of weight. As soon as I tell them this, there is always a light bulb that goes off, along with surprise, of course. Again, the body is a machine. Machines follow the laws of physics, but how many of us can explain physics well enough for a fifth-grader to understand? Visualization is key. Working with Plain Language: A Training Manual, written by William H. DuBay, has a great deal of information on the background of plain language, why it is necessary, and how to apply it in all manners. One of our greatest joys as health, wellness, and fitness specialists is seeing the people we work with succeed. So let’s find that common ground where we are not just talking to our clients, but discussing with our clients about their health, wellness, and happiness. Interested in how you can do wellness better for your residents? Grab our quick read below to see how you can better evaluate your wellness offerings in your senior living community. In the fitness and health field, we are asked for advice continually. It is our job to build fitness routines that are safe, comfortable, and something our clients will actually build into an overall resident wellness lifestyle. The difficult part always seems to be creating a program that they like that also fits around all contraindications of diseases and ailments, and having them not give up after a week. After observing many fitness professionals with their clients and many years in practice myself, I noticed that one of the greatest obstacles is neither of those two problems, but our ability to communicate with the client and find that connection for them. I’m not talking about the connection of personalities and ability to get along, but that connection where the client understands your thought process and why you are putting them through the “torture.” Education is the key to our success with the clients, and it is how that education is delivered that matters most. We as practitioners already know why we are doing this, so we forget to pass that knowledge on. We move on to demonstrating the exercises and correcting their movements and posture as they do the exercise, until they look like a pro to anyone coming in, but they still are not quite sure why they are doing that exact movement. I may be one of the biggest “older” kids out there, but I still love the question “Why?” I truly feel that if we understand why we are doing what we are doing, we will stick to it better. Also, if we understand a subject it is more interesting to us. If it is more interesting, we tend to want to try to learn more and become proficient. The trick becomes how to properly educate and make a lifelong plan with our clients rather than just doing it to our clients. We have to know that those why and how questions are running through their heads and take the initiative to help them answer the questions they don’t even know to ask or how to form. The next challenge is the client understanding what you are saying. The Quick Guide to Healthy Literacy, a fact sheet produced by the United States Office of Disease Prevention and Health Promotion, states that “only 12 percent of adults have proficient health literacy.” Impact Information Plain Language Services’ newsletter reports that all health and safety information should be delivered at a fifth-grade comprehension level. Health information is difficult for most people to understand. There is no difference in the world of wellness. We are asking our clients to trust what we are saying and what we are telling them to do, but many do not understand why they are doing the exercise we are teaching or how those exercises will help make them feel better, possibly decrease potential for chronic diseases, and even lessen the severity of other chronic diseases. Think about this information and think about what you do. Do you work with your clients, or do you talk to them? You will probably find there is a little of each happening. Watch for part 2 to learn some tips on how to work with your clients and help them enjoy the wellness they are working with you to achieve. Senior living communities commonly miss out on the opportunity to have a qualified person on staff to help guide residents in the fitness center. 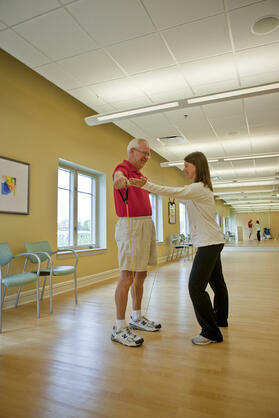 Click below to check out our quick read, The Impact of Staff on Senior Fitness.